Did you know orcas are also called Killer whales? 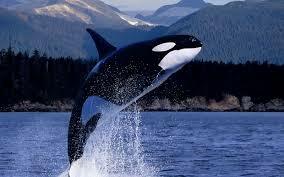 Orcas get the name “Killer Whale” because they are very violent to other animals in the wild. Another native name for an orca is called Blackfish. Orcas live in pods. Pods are groups of marine mammals of the same species. If another animal that is not a part the pod comes into the pod the males will kill that animal. Orcas can swim 100 miles a day in their pods. In captivity orcas are kept in 1% of their natural spaces and they are slaves to entertainment. They also die at the age of 25-30 years old. Female orcas can live up to 100 years old while the males live to 50 years. Orcas dorsal fins can be up to 6 and a half feet tall! This post is for my big brother, Decker. He loves dolphins! because they have great eyesight and hearing skills! 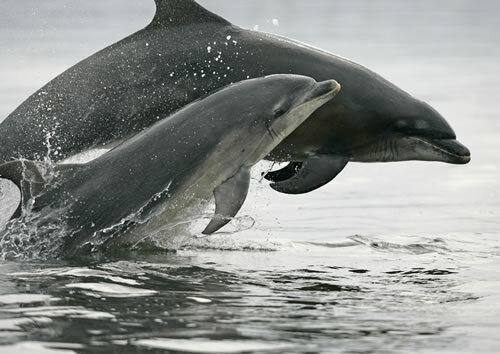 Bottlenose Dolphins can make there own music by the sounds they make. They send messages in many ways. Using clicks and whistles, they can alert each other if they smell danger or if fish are swimming by. Bottlenose dolphins use echolocation to find food and other things, just like bats! First, they make a high-pitched sound. Next, that sound travels through the water and hits it’s target. Then the sound returns to the dolphin like an echo. This echo tells the dolphin how far away something is, how big it is, and how fast it is moving. Their great hearing helps! Some scientists think that the sounds travel through their jaws and into their inner ear. Dolphins are mammals like us, so that means that they have to breath air. They breath through their blowholes, and these blowholes open and close to let air in and keep water out. Two weekends ago, my friends Trey, Victoria, Brooklyn, and I put up a lemonade stand. We wanted to raise enough money to adopt a Manatee from the Save the Manatee Club, because Manatees are endangered. My brother helped us by making colorful signs that said “Save the Manatees.” When we were done, we had raised $24. My mom gave us an extra dollar so we would have enough money to adopt a Manatee named Whiskers. 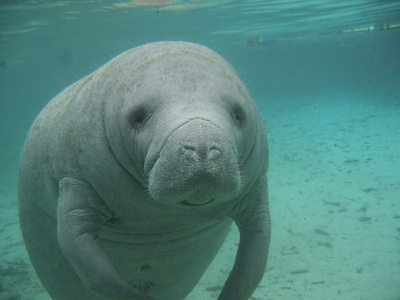 Did you know that manatee’s closest relative is the elephant? They can grow 13′ long and can weigh up to 1,300 pounds? They are pretty big, and they are good swimmers. They swim about 5 miles per hour. They swim by flapping their tails up and down, and steer with their stretchy flippers. If they’re in really shallow water, they use their front flippers to walk on while they eat sea plants and grasses. Because they are so slow, and like warm, shallow water, Manatees often get hurt by boat propellers when the drivers don’t see them. Manatees are sea mammals like whales and dolphins. They live in water, and go to the surface to breathe air. They can stay underwater for up to 15 minutes, if they are resting. A long time ago, people used to hunt Manatees for their meat, skin, and oil. Today, there are laws to protect them. If you would like to adopt a Manatee, or learn even more about them, you can go to www.SaveTheManatee.org. 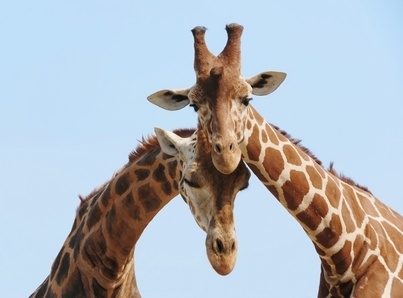 This post is for Victoria who loves animals, especially giraffes. Did you know that the giraffe is the tallest animal in the world? They can grow up to 18 feet high! Their long legs and neck help them eat leaves from tall trees. Their favorite food is the thorny leaves of an acacia tree. The predators giraffes have to look out for the most are lions. If a giraffe senses danger he or she sends a signal to the rest of the herd. Then they all take off running at up to 35 miles per hour! If a lion tries to catch a baby giraffe, and the mom sees this, she will get ready for a fight with the lion! Her strong legs could kick and kill a lion. When they are fully grown, most lions won’t mess with giraffes. This is for my friend’s mom, Miss Shari. 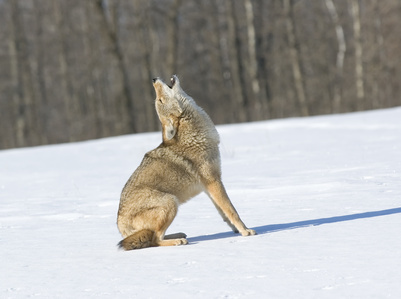 Did you know that coyotes live all over the United States? This might be really hard to believe but coyotes even live in big cities like Los Angeles and Dallas, Texas. Coyotes can have up to twelve pups. Coyote pups are born in spring, and when their mom thinks they’re ready, they come out of their den to play and learn. To teach their pups to hunt, a mother coyote catches a mouse very carefully, then she lets the pups chase after them until they catch one. Coyotes are very good tricksters. Sometimes they jump around like goofs while birds watch. Then his or her partner will catch them for diner. That’s a good hunting trick. In the hills by my house, where my family and I like to run and hike, there are a lot of coyotes. My school’s mascot is even a coyote. This post is for my friend, and classmate Trevor. Did you know that 40 years ago American Alligators were almost extinct? People kept using their skin for shoes, purses, hats, and belts. Even though they used to be on the endangered species list, there are now over a million American Alligators today. Alligators are reptiles like snakes and turtles. They lay eggs. To protect the nest the female guards the nest from other creatures. When the eggs hatch the babies make noise so the mom hears them. When she hears them, she scurries up the nest and carries her babies in her mouth until she reaches the water. This is for Rilee, who loves Capybaras! Capybaras have very sharp teeth . They are the biggest members of the rodent family. They love to swim, unlike other rodents. When they sense fear, sometimes they dive under water. They can stay underwater for 5 minutes! Can you imagine that? They can even sleep underwater with just their noses poking out. Capybara means “Master of all grasses.” That is a good name because they eat a lot of grass and live in grasslands. Did you know that Leatherback Sea Turtles are the biggest turtles on earth? I learned a lot about them on National Geographic Kids.